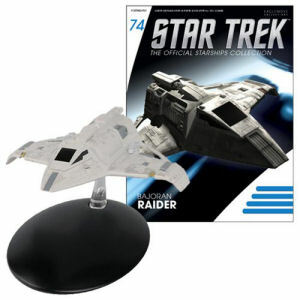 We have Just Sold out of Star Trek Starships Bajoran Raider Vehicle with Collector Magazine. Not to Worry! Fill in the Notify me When Available and you will be the first in line for our restock of Star Trek Starships Bajoran Raider Vehicle with Collector Magazine !! From the Star Trek Starships collection by Eaglemoss Publications. Star Trek Starships Bajoran Raider Vehicle with Collector Magazine. Add this incredibly detailed diecast starship to your collection. The Star Trek starships collection includes all of the most significant ships from the 5 television series. Starship comes with a collector magazine! Ages 14 and up. Eaglemoss Publications Star Trek Die Cast shipping from Canada. No Surprise Border fees or Customs!